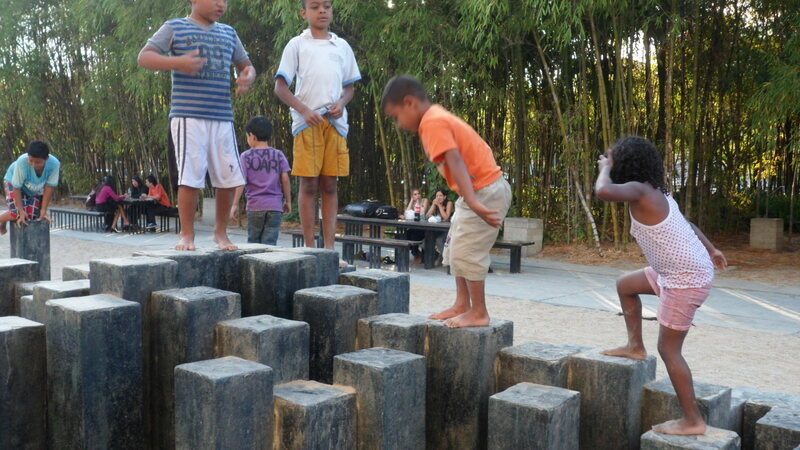 In Medellín, Colombia, people don’t just learn in the park–they learn from it. Place: Medellín, Colombia, an urban sprawl of 3.5 million known for its industrial strength and, more recently, its impressive public engagement. History: The Barefoot Park was inaugurated in 1999, and opened to the public one year later. 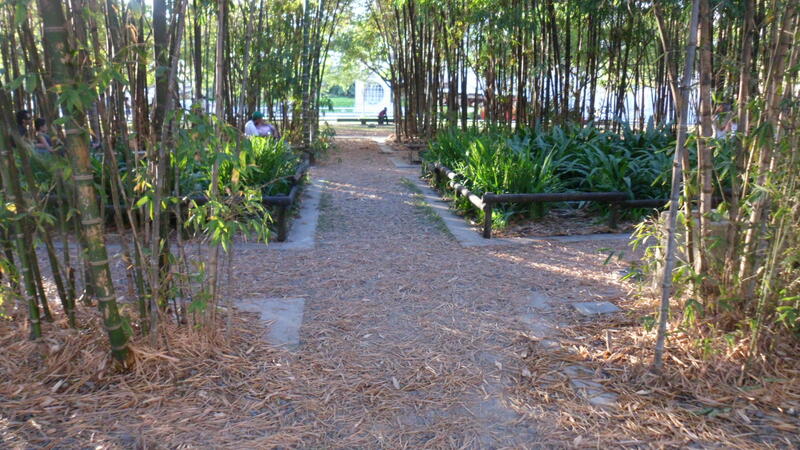 The Skinny: Hard to imagine how a public park could challenge conventional models of schooling, but the brilliant design of this urban space shows how learning can happen anywhere–if we remember that “learning” goes beyond the abstract, and is also a process of directly experiencing the world through touch, taste and feel. More Info: There’s some tourist info online, but to understand the park’s pedagogical potential, you’ve got to take off your shoes, and walk through it yourself. Five years ago, when I was spending most of my energy correcting student essays and planning lessons, it never would’ve occurred to me that a public park could be an alternative to school. But after a couple of years of studying what learning is, and reconsidering what “school” can be, I’m beginning to see authentic learning spaces everywhere I look–even in the bustling center of Medellín, Colombia’s second largest city. 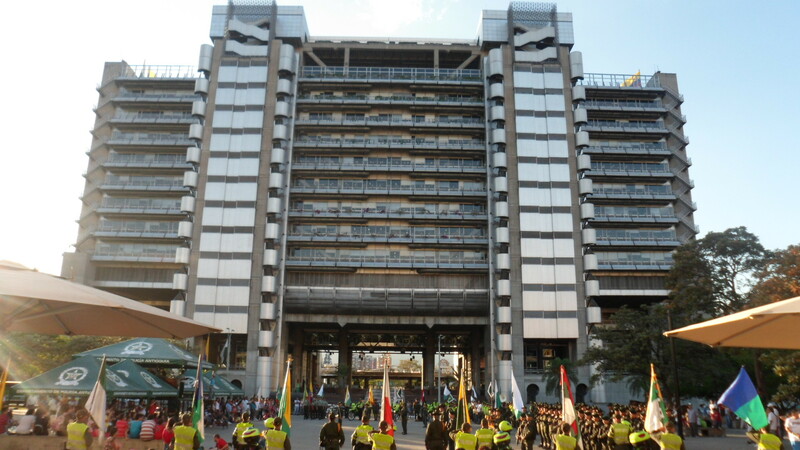 Nothing peaceful about Medellin’s public utility building, but its director was the visionary behind the Barefoot Park. Set in the shadow of a Blade Runneresque public utility building, El Parque de los Pies Descalzos (the Barefoot Park) is far more than a nice urban space. It was envisioned by a director of the public utility company, who was concerned not with learning and education, but with the productivity of his workers. In the mid-1990’s he commissioned a group of designers to study relaxation and focusing techniques from cultures around the world. They came back to him with the idea of a Barefoot Park, where his workers could go outside during breaks, take off their shoes, and step over various types of surfaces, which would revive them and keep them happily working at their desks till it was time to punch out. 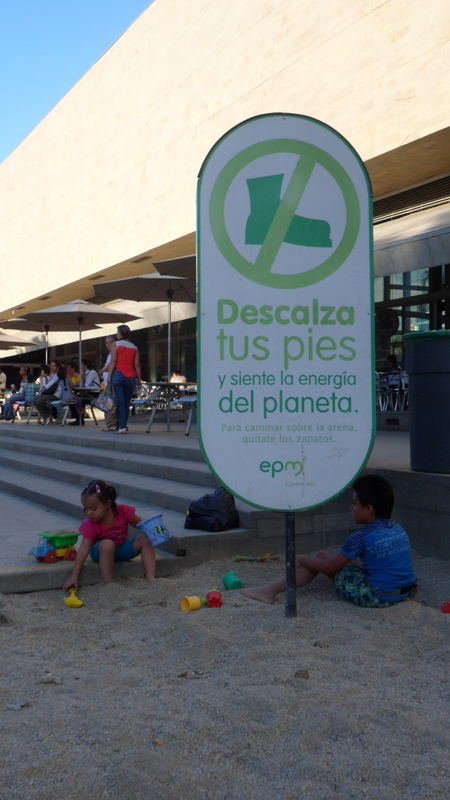 “Go barefoot–and feel the planet’s energy.” Sign welcoming people into one of the Barefoot Park’s enormous public space sandboxes. This history was shared with me by one of the college interns, dressed in Jurassic Park khaki, who is paid by the city to guide people through the park. He explained that once the park was finished, in 1999, the public utilities administration, and the city government, realized it would be impossible–and selfish–to try to keep the public out of such an attractive space. Today, the park is free, open to the public, maintained by the city, and, if the two days I visited with my family are any indicator, extremely popular. In fact, the Barefoot Park is an almost completely text-free environment, which I found very refreshing, and which I think makes it even more engaging and inviting for people who aren’t as fascinated with words as I am. Apart from one inconspicuous welcome sign, there are no instructions, no explanations, no justifications: simply step in, and let your body lead. The park consists of four types of areas (photos below), well-distributed over a fairly compact space, maybe a few acres in all–enough room that you can find a place to take a nap, but not so much that a lost kid will stay lost for long. Each area is like an academic subject for the body, which you’ll learn best if you take the “lessons” in through the soles of your bare feet. Stepping through the enormous sand boxes stimulate all sorts of energies we western folks have grown expert at ignoring (as I walked through, I kept feeling twinges in my abdomen); walking over the dull, round pebbles of the shady bamboo (technically “guadua” in these parts) is a lesson in discomfort and acceptance; the grassy areas teach about coolness and calm; and the step-in fountains refresh and energize. For more advanced “sense” learners, the park designers have added some twists. 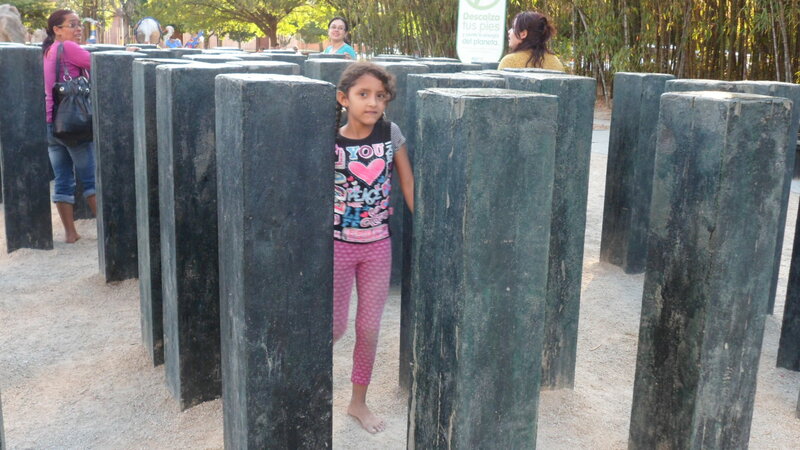 The sand areas have stone columns to walk over, which test your balance and your ability to negotiate with the oncoming tyke standing on your next step. There’s a mini labyrinth you navigate with your eyes shut, attuning your non-sight senses and teaching a little empathy towards people who can’t see. The leaves of the guadua trees create a complex rustling symphony in the wind, for those quiet enough to listen. And one of the fountain areas, a flat patio with inconspicuous spouts built into the cement, shoots up its bursts of water at random, inspiring the anticipation and excitement of the soaked kids standing around. You could make a good argument that the park also crosses the line, like all good education, into public health as well. Apart from reinvigorating people (the public utility workers apparently still come down during breaks) Christian pointed out that he recently read a theory that the simple act of walking barefoot for 10 minutes a day, in natural surroundings, is a tried and true healing process. My brother came back from a naturalist seminar once—I think a Tom Brown workshop—determined to walk barefoot as much as possible: shoes, he told me, are coffins for the feet. Some more recognizable “classes” do occur in the park—during my visit, I observed a discussion group of college kids and a massage session being led by one of the city interns–but like a good museum, an excellent Montessori classroom, or a piece of untouched nature, the park itself is the primary teacher here, offering a brilliant curriculum of sand, stone, trees, grass, water. Children must negotiate gravity–and each other–as they attempt to make their way across block columns. This girl’s cheating: your eyes are supposed to be closed as you wind through the labyrinth. Larger pebbles and rushing leaves create a sense of calm in the mini guadua forests. 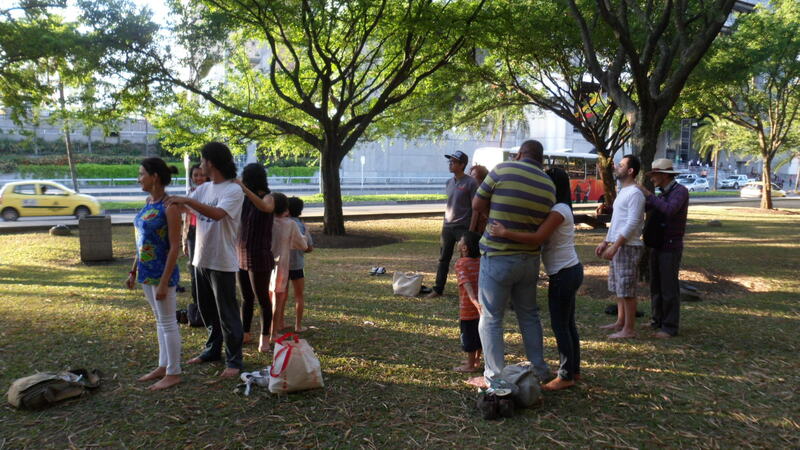 A student intern leads this group through massages in one of the park’s grass areas. 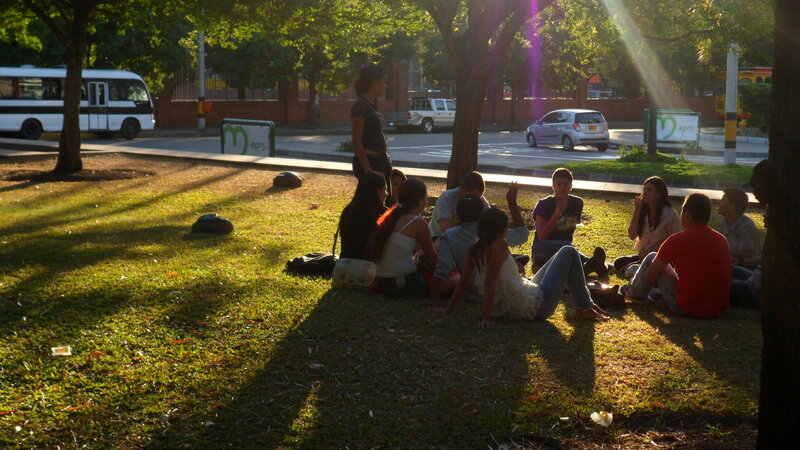 The grassy area is home to more formal pedagogical activities, like this discussion group. One of the park’s four water areas, crowded with barefeet or all ages, both times we visited. When people build sand sculptures, invent balance games, work together to capture water, they are not only developing their sense literacy, but they are also developing what learning expert Ellen Galinksy calls the essential skills for success in classrooms, skills like focus and self-control, self-direction, critical thinking, and communicating. Preschools all over the world, including the Sadhana Village School in India, hold this idea at its center. Elementary and secondary schools—even universities—would do well to follow suit. 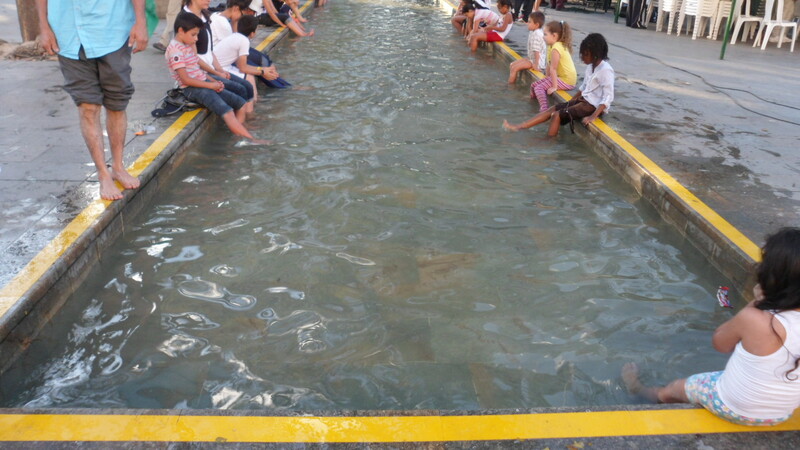 In Medellín, it’s doubtful the Barefoot Park would reach a fraction of the population it does if the city attempted to control the learning by, say, restricting access to guided tours led by facilitators. (Okay, now everyone take off your shoes. What do you feel?) Fortunately, the designers knew this, and the place is, in the end, a natural playground, offering learning at its purest: rich, engaging, multi-dimensional, and limited only by one’s own imagination. Thanks for the mention of the book and of Ellen Galinsky’s book. Many cities, including New York City have experimented with “learning parks.” They used to be called adventure playgrounds. In Santa Fe the Railyard Park has the potential to offer this kind of public space. The key is often to have staff available to facilitate experiential learning and also to keep track of “loose parts.” In NYC, the city hired “Play workers” (not sure that is the title) to staff parks. Thanks for the comments, Mom and Nanda. Mom, I’ll look into the “learning parks” concept–thanks for the connection. Also be curious to find out what sorts of “learning playgrounds” have been designed for schools. Maybe with a little rethinking about what skills are learned while playing, teachers could start counting recess among their instructional minutes…. seth, the park you describe is inspirational. most modern city living people are sensory deprive. this is a terrible loss to the development of the “whole child” in their ability to learn. i have been to clinics that artificially have set ups to stimulate sensory integration and charge lots of money for this too. You are currently reading Profile: The Barefoot Park at School Re-formed.